The Sewers (下水道) is a series of areas that connect to several other areas and lead to an event. The sewers are also inhabited by shadowy creatures. The player goes to the first area of the Sewers by going into the manhole in the Insides. The only possible way to go from here is to the left, which leads to the second area of the Sewers. When this area is visited by Rust, a single Fetus will wander here. The second area has an orange symbol on the wall, which teleports the player to the Orange Maze upon interacting with it, and this area also allows the player to return to the first area using another path. Proceeding further to the right, past the first area, leads the player to the Wastewater area. Proceeding to the left will move the player to the third area of the Sewers. The Wastewater (廃水) area is a special area of the Sewers, since this is where the Blood, Pus, Rust event can be triggered. Also, by going inside of the pipe and to the right, the player will arrive to the Wastewater Lake. The third area of the Sewers only contains an entrance to the Sugar Hole. Proceeding further to the left will move the player to the fourth area of the Sewers. The fourth area is split in two parts by a chasm. When accessed from the third area, it contains nothing worth noting, except for a single Fetus that appears when Rust visits the area. When accessed from the fifth area of the Sewers, it contains another entrance to the Sugar Hole. The fifth area of the Sewers can be accessed only through a manhole in the Psychedelic Town Harbour, and it leads back to the enclosed section of the fourth area. 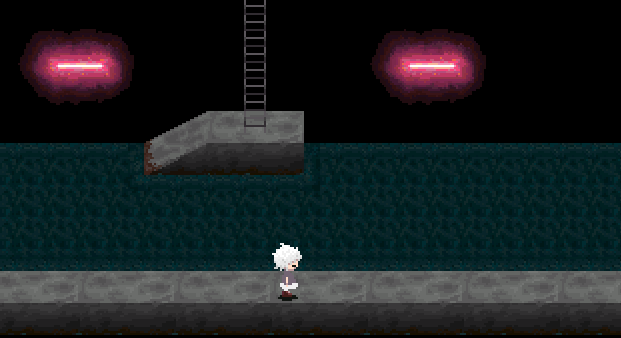 There is a sewer area in Yume Nikki, making this a possible reference.